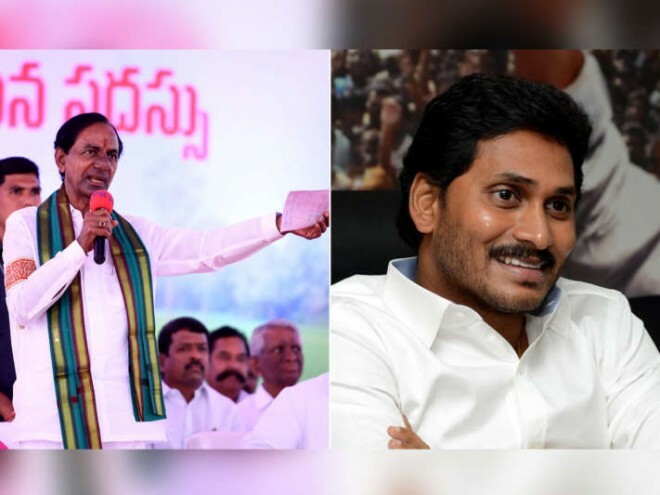 Hyderabad, Mar 30: Last year in November, Telangana chief minister president K Chandrasekhar Rao performed Raja Syamala Yagam, a Hindu ritual which used to be performed by kings for victory in wars, at his farmhouse at Erravelli in Siddipet district. The yagam was performed under the advocacy of Sri Swamy Swaroopanandendra Saraswati of Saradha Peetham. The Telangana Rashtra Samithi president believed that such a yagam would yield him victory in the elections. As he wished, the TRS achieved fabulous victory in the December 7 assembly elections by winning 88 out of 119 assembly seats in the state. Its total has now gone up to 101 now due to defection of opposition MLAs. Taking a suggestion from KCR, YSRCP chief Y S Jaganmohan Reddy, also performed Raja Syamala Yagam for three days starting from March 27 to 29. The Yagam, seeking divine blessings to him for achieving victory was held at Nellore under the patronage of the same Sarada peetham seer. A total of 27 Ritviks participated in the ritual. The yagam concluded with "poornahuthi" (offering ghee and other material to the flames) on Friday afternoon. Though Jagan and his family members did not attend the yagam, it was supervised by YSRCP's Rajya Sabha member Vemireddy Prabhakar Reddy.